This E-Learning Heroes challenge was to create your own set of icons, buttons or stickers. You can find the assignment here. 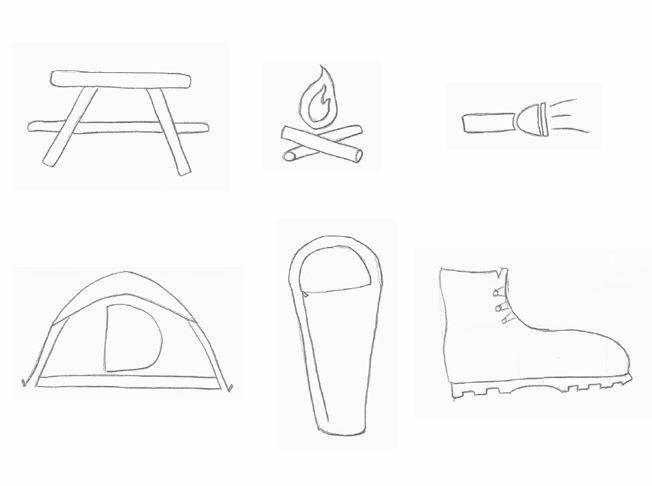 I chose to create a set of camping icons including a picnic table, campfire, flashlight, tent, sleeping bag and hiking boot. I began by sketching each item on a piece of paper and then scanned them into my computer. Then I used Adobe Illustrator to trace my drawing and create each graphic. To make things simpler, I imported each graphic into Powerpoint to create the background of each icon. I really like Joanna Kurpiewska's sticker effect, so I created the first set using her method but without the curl. I also found two other similar styles that I really liked on Dianne Hope's Icon Design Pinterest board, so I created two more sets of icons using those styles.